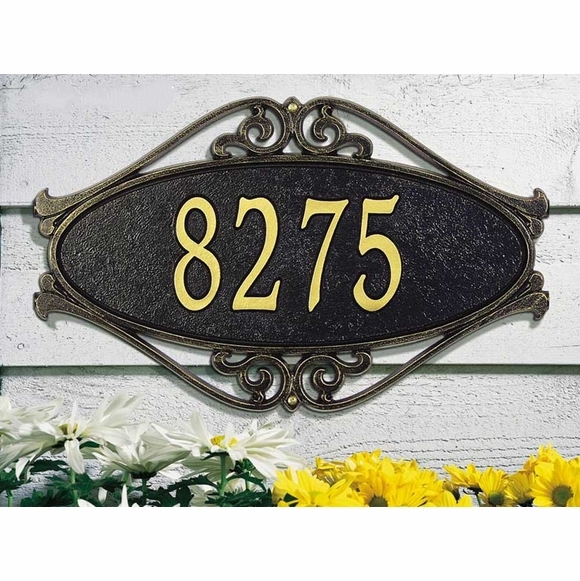 Personalized Oval Fretwork Address Plaque - - 17.5" x 11" oval address sign surrounded by a decorative fretwork frame. Made in USA. Whitehall Hackley Fretwork one-line or two-line plaque is available with lawn stakes or for wall mount. The one-line version holds up to five 4" numbers. The two-line version holds up to five 3" numbers on line 1 and up to fourteen 1.25" characters (including spaces) on line 2. Three color combinations: BG black with gold characters (large image); AC antique copper (small image on left); OG bronze with gold characters (small image on right). Dimensions: 17.5"W x 11"H x 0.5". The quality is 5 star! Looks, color, alignment is extremely pleasing, perfect. Heads a nice weight to it. Shipping was quick. I'd order from this company again.